Create QR codes in 8 easy steps online and download it for free use forever. How do I make a QR code online? You can use Beaconstac’s QR code generator to create a completely customized QR code. 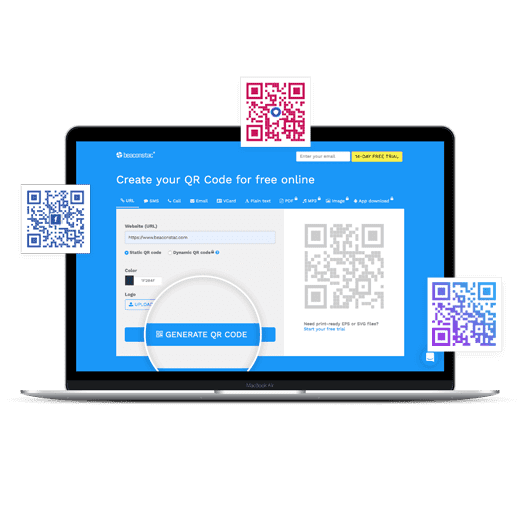 From changing the color to changing the logo in the center of the QR code, Beaconstac’s QR code generator allows you to create completely customized QR codes for free online. Select a QR code generator that allows you to create QR codes easily and efficiently. You can choose the Beaconstac’s QR code generator to create completely customized free QR codes right away. Do you want to display an offer or your landing page or even get users to give you a missed call on scanning the QR code? QR codes allow you to display different types of content. Here’s what you can do with QR codes. If you decide to use the QR code to link to your website, type or paste your URL in the QR code generator. You can also enter the text you wish to display in a predefined text message and Email. Depending on the type of QR code you want to create, you can change the content to be displayed. Several free QR code generators do not give you the option to customize the QR code and you end up with a black and white QR code. With Beaconstac’s QR code generator, you can customize the colors of the QR code, add a logo and use it for free forever. There are two different types of QR codes - static and dynamic. Static QR codes can only be used for a single purpose. Once you create the QR code, there is no way to change the information or show a different offer. This is helpful if you are using the QR code generator to create VCards, predefined text and email or a missed call campaign. Need a QR code that evolves with your needs? Try multi-campaign dynamic QR codes that give you complete control and freedom over your campaigns. Whether you intend on displaying different campaigns throughout the day, week or month, a single multi-campaign dynamic QR code can be re-used and re-purposed. Once you enter all the necessary details, click to generate your QR code. You may want to test it now to ensure it is working as intended. You can download QR codes in a format of your preference such as PNG, EPS and SVG. One of the reasons why QR code is preferred is that you can actually track the number of times your QR code was scanned and analyze the performance with insights such as device, country, and time of the scan. Beaconstac also allows you to retarget users on Google and Facebook once they have scanned your QR code. STEP 1: Look up a QR code generator. On Android or iPhones, you can look up Beaconstac’s QR code generator to create QR codes online for free right from your smartphone. STEP 2: Decide what kind of QR code you want to make. It could be a Video QR code, Website QR code or even a Plain Text QR code. STEP 3: Choose between static and dynamic. A dynamic QR code can evolve with your changing needs. So, if you are looking to create a Website QR code or a business card, choose a dynamic QR code. STEP 4: Customize your QR code. Change the color of your QR code as per your needs. You can even add a logo at this point. STEP 5: Generate and test your QR code. Make sure your colorful QR code is scannable and performs the intended action. Scan QR codes with Android and iPhone. STEP 6: Download it. You can then save it on your phone as PNG, EPS or SVG and use it for free forever. Black and white QR codes are a thing of the past. You can customize your QR code to your liking and in sync with your branding to make them as personalized as you desire. How do you turn a URL into a QR code? On the Beaconstac’s QR code generator, all you have to do is enter the URL of the website or webpage that you need a QR code for and customize it as needed. You can add a logo, change the color and download in PNG format. Create a universal link for an app and utilize that URL in the Beaconstac’s QR code generator to create a QR code. When this QR code is scanned, it will direct users to their respective App Store. How do I link a QR code to a Google form? After creating your Google form, get the URL and insert it in the Beaconstac’s QR code generator to create a QR code which when scanned asks users to fill out your Google form. How do I email a QR code? Download your QR code after creating it and share it as an attachment in the email to the intended recipient. How do I turn a PDF into a QR code? You can now share PDFs with a PDF QR code. Simply take the link of your PDF and input it in the QR code generator. Generate your QR code to share it as a standalone image or place it on a poster. How to create a vCard QR code? A vCard QR code when scanned allows anyone to save your contact information instantly. You can create one by entering your first name or business name, phone number and email address in the QR code generator. Customize it to keep it in sync with your branding by adding color and your logo to the QR code. How to create a Facebook Messenger Scan code? You can now add anyone on Messenger without searching for their profile online. Open your Messenger app on your smartphone and click on your profile. You will find two options: My Code and Scan Code. Tap on Scan Code to add someone online. Tapping on Scan Code will open up your camera and scan someone’s Messenger Code to add them instantly. Your Messenger Code is ready-made and you can see it when you click on your profile. How to create QR Codes for retail? You can create different types of QR codes for retail throughout the store to implement different use cases. Video QR Codes: Let your consumers see your products in action with a Video QR Code. This can either be an advertisement for the product or a way to educate the consumer on the right way to use the product. If you have a product that can be used for more than one purpose, instead of having a cluttered packaging, you can use a Video QR code. Scan and Go QR Codes: With e-commerce threatening the very existence of retail, a long checkout line can lead to higher cart abandonment rates. Let consumers skip checkout lines and scan QR codes to add products to their cart and checkout instantly. Decathlon, Walmart and Zippin leverage this technology to create better customer experiences. QR Codes for re-ordering: Increase post-purchase engagement by letting your customer re-order the product by scanning the QR code on the packaging. Attach the specific link of the product from your online store in the QR code. Alternatively, you can also let consumers scan the QR code and call or email you to order the product. Facebook QR Code: Want to grow your Facebook page? Place a Facebook QR code on the product to enable shoppers to like, follow and leave a review online. Coupon QR Code: According to Juniper Research, 1.05 billion users will use digital coupons. The QR code on the product can serve as a Coupon QR code. Want to display a different discount at different times in the day, week or month? Choose dynamic QR codes. A dynamic Coupon QR code will allow you to change the offer code in real time. QR codes are 2D barcodes that when scanned perform a certain action. It could either open a website, make a call, send an SMS, open up Google Maps among several other things. QR codes are read by a smartphone’s image sensor and then interpreted by the processor in the phone. Unlike 2D barcodes, QR codes can be digitally scanned. The three large squares in a QR code help to align the target and the smaller square helps to normalize the size and angle of the shot. What can you use QR codes for? There are a number of ways marketers and businesses can use QR codes to drive their ROI. 2. Send preset SMSes: You can use QR codes to send a preset text message to a predetermined recipient. 3. Send emails: Leverage QR codes to send emails complete with subject and recipient. 4. Call businesses: Businesses can have users call them instantly by scanning QR codes. 5. Discounts and coupon codes: QR code coupons are very popular amongst businesses and customers alike. 6. Navigation: Businesses can direct in-store traffic by creating a QR code to reveal the location on Google Maps. 7. Add events to calendar: QR codes take out the manual work of adding events to your calendar. Scanning a QR code does the job for you. 8. Connect to the WiFi: Customers no longer need to ask for the password to connect to the store’s WiFi. All they have to do is scan the QR code. 9. Follow social media profiles: Scanning a QR code allows consumers to instantly follow social media profiles. 10. App downloads: Businesses can encourage app downloads through QR codes that lead to the user’s respective App Store. How small can a QR code be? The Beaconstac QR code generator allows you to create QR codes for free without asking you to sign up. Do free QR codes have a limit? Most online QR code generators offer a free trial or limit the number of scans for the QR code you create but that is not the case with Beaconstac’s QR code generator. Once you create your QR code, you can use it forever with unlimited scans. However, if you do plan on changing the URL or using the same QR code to perform a different action, you can switch to a Platform Plan that offers variable or dynamic QR codes that allows you to re-use the same QR code but redirect it to a different link. Does scanning a QR code require the Internet? No. You can scan all QR codes without the Internet. However, if the QR code requires to open a URL, you will need the Internet for this. If you choose a QR code from most free QR code generators available online, they expire in a week and start redirecting to their own website. Want a free QR code with unlimited scans that is free forever? Try Beaconstac’s QR code generator. A guide on how to scan a QR code without an app using Android, iPhone or desktop devices. QR Code Basics- Learn all about QR codes, types of QR codes, how to create and use a QR code with related examples and FAQs. What are the types of QR? Discover all about the various types of QR codes and choose the right one for your business needs.